Eli Evans has taken out Heat 1 of the Netier National Capital Rally in Canberra after a dominant first day. Driving a leased Skoda Fabia R5, Evans drove faultlessly all day, and ended the day 46.3 seconds ahead of Steve Glenney’s Subaru WRX STi. Evans was happy with his day, despite the extremely rough conditions. “It was a tough day. The roads were very rough and even the R5 struggled with the bumps,” Evans said. Continuing his run of second places, Glenney maintains his second position in the championship overnight. The job for Evans and Glenney, however, was made easier due to Harry Bates’ turbo problems. “Harry’s problems don’t change our approach, but we obviously want to capitalise from his misfortune as much as we can,” Evans added. Bates’ Toyota Yaris AP4 suffered turbo troubles in the afternoon’s second last stage. “It’s disappointing. I looked at the split times from the stage before the problem, and we were up on Eli and the rest of the field,” Bates lamented. Adrian Coppin is sitting in third position overnight, after a relatively trouble-free day. Coppin was happy with how he and his Skoda Fabia R5 performed throughout the day. “The car is amazing. It’s super easy to drive,” Coppin said. Subaru’s Molly Taylor had a difficult day, which a punctures and multiple bent rims in the tough conditions. She will be looking to move up the standings in tomorrow’s stages south-west of Canberra. 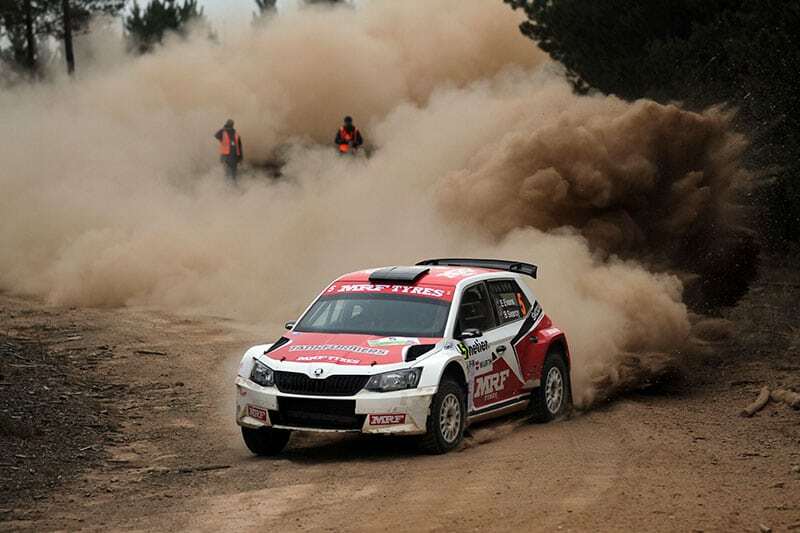 Yusai Sumiyama (Skoda Fabia R5) and Mike Young (Toyota Vitz AP4), lead the APRC field. Second placed Young said he was happy to finish the opening leg. “We had some troubles towards the end of the day. We had to stop and change a puncture, so we lost time there,” Young explained. Italian driver, Fabio Frisiero, retired on the day’s second stage in his Peugeot AP4. Other retirements included Lewis Bates and Coral Taylor, who suffered engine damage when they broke an oil line on the Toyora Corolla S2000 after a jump, and Wayne Morton and Kirra Penny, who damaged the front of the two-door Subaru WRX STi in an incident on special stage two. Michael Harding was a non-starter due to a head gasket failure in their Subaru. Adam Kaplan and Aleshia Penny lead the two-wheel-drive class in their Nissan 370Z, from Haowen Chu and Pete Hellwig in a Ford Fiesta.